The Sanga Initiative members at one of their summer retreats. New youth organization The Sanga Initiative just launched in October of last year, but it’s already inspiring North American youth to pursue big ideals – building relationships, offering service to ISKCON, and setting the foundation to become future leaders in their communities. The Sanga Initiative hopes to hit the ground running because it already has a sizeable base of members. Youth involved previously held annual summer retreats for the past decade under the name “Pandava Sena,” after the successful UK-based youth organization. About 50 to 100 youth, aged 15 to 30 and hailing from New Jersey, Houston, Chicago, Atlanta, Gainesville and a few other mainly East Coast cities are currently affiliated. While the Pandava Sena name was used loosely, The Sanga Initiative is the first time these youth have created an official non-profit organization, run by a board, that will organize activities throughout the year and not just in the summer. The Sanga Initiative’s first summer retreat will be held from July 31st to August 5th at the Gita Nagari farm community in Port Royal, Pennsylvania, and is expected to draw 50 to 70 youth. Two or three senior devotee guest speakers – to be announced when registration kicks off on May 1st at sangainitiative.org – will give seminars on various spiritual topics. There will also be outdoor activities as youth get a chance to interact with Gita Nagari’s large dairy herd. And of course, there will be rocking kirtans and delicious prasadam. A major highlight of the retreat will be the inspirational “sangas” that have been held for several years and inspired the name The Sanga Initiative. Youth leaders have found that many lifelong relationships have been forged over the years just from the six days spent as part of a sanga during the summer retreat. Organizers hope that this year’s retreat will set the tone for future Sanga Initiative retreats, and inspire youth to continue their sanga groups online throughout the year at sangainitiative.org. Youth from all over the country will be able to continue developing relationships through conference calls and video chats every month, which Poonam believes will naturally lead to service projects. Other Krishna conscious activities will also sprout from the sangas. A book club, for example, has already formed and discussions are held every week on Srila Prabhupada’s books and other spiritual works through Google Hangouts. Newcomers are welcome to join by sending an email to info@sangainitiative.org. She hopes that youth attending this year’s summer retreat will go home and spread news of all these efforts across their own communities like wildfire. 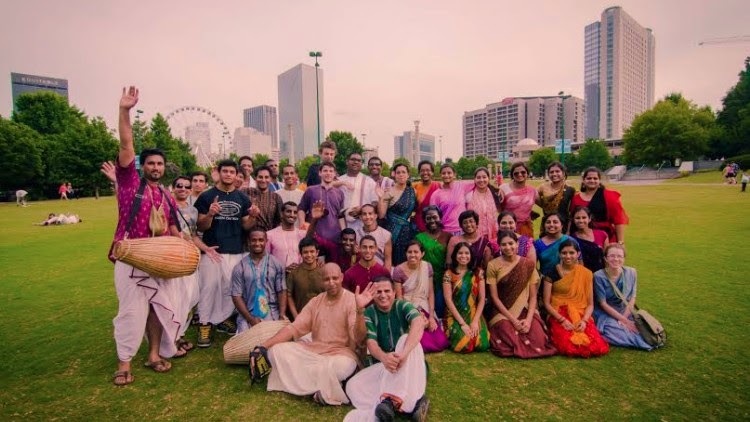 “We’d would love it if The Sanga Initiative became the way to connect youth in North America that are really fired up in Krishna consciousness,” she says. To get connected, please visit Sangainitiative.org.